#thismymob has been awarded funding as part of the ARC Discovery Indigenous scheme to design and test technology to improve health and wellbeing in Indigenous communities. 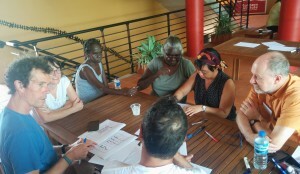 We’ll work with communities at several locations in urban, regional and remote Australia, using participatory methods to create and trial mobile, Internet-based technology. 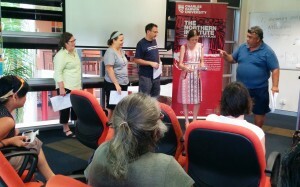 Steven Bird organized a Workshop on Technology and Wellbeing in the Top End in Darwin in April. Steven, Chris Lawrence and Greg Wadley of the University of Melbourne traveled to Darwin to work with representatives of Indigenous groups, researchers from Charles Darwin University and Batchelor Institute, and local and interstate app developers, to explore possibilities for technology to improve health and wellbeing in northern Australia. #thismymob is an Australian- and Indigenous-led international project, based at UTS and the University of Melbourne, that aims to design and evaluate technologies that “close the gap” by improving the health, wellbeing and connectedness of Indigenous peoples.